Closing the Gap: Where Do We Go from Here? While preparing this book, we have thought about all of the times when we have felt our patients did not accept their diagnosis, and did not wish to follow our recommendations. It has happened often. 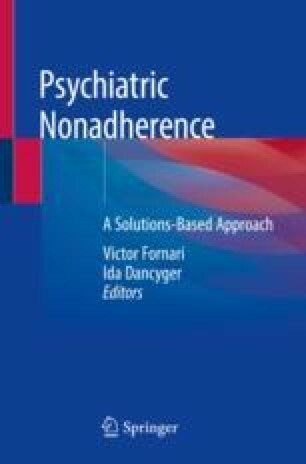 We realized that what we have viewed as psychiatric nonadherence may actually have been lack of acceptance of the diagnosis. We have seen this over and over again in our clinical practices. Even when the diagnosis and treatment are accepted, when the symptoms are in remission, the patient may question whether they really needed to continue taking the medication. Often relapse of symptoms and re-hospitalization may be the result of this cycle of nonadherence. We then began to consider what other reasons contributed to nonadherence to treatment. We developed a preliminary list that included the most common reasons for treatment non-compliance we have witnessed over the past 30 years. This thinking led to the development of a “Psychiatric Patient Adherence Checklist” that we believe clinicians need to pay careful attention to. Although not a validated instrument, we think that this could become an important clinical tool to enhance adherence and guide the clinician. We propose that this may be yet another step toward solving the serious dilemma of psychiatric nonadherence to treatment.